I am a member of the OathKeepers, who has a website. Since my last Constitution 101 essay subject material was the US Judiciary, the following article and link to it is quite appropriate and clearly demonstrates media bias linked with judges who do not obey, but ignore, the rule of law. Maybe it is because there are SO MANY laws on the books they cannot keep track? The hero of the story is Joel Boniek, once a member of the state legislature [House] from 2008 to 2011 and was a candidate for Lieutenant Governor of Montana in the 2012 election. 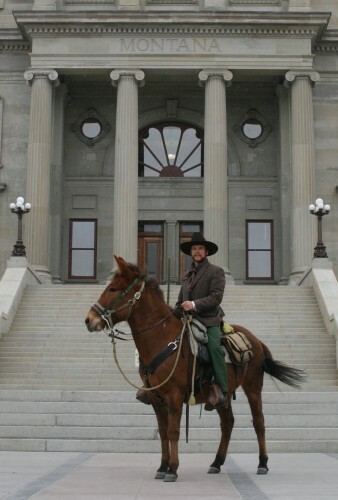 He rode to the state legislator’s building on his horse, Jesse. His main motto: Bigger government is the CAUSE of problems, not the solution. In 2008, Joel Boniek was elected to the House District 61. In 2009 he introduced a bill by Gary Marbutentitled Montana Firearms Freedom Act of 2009. The bill passed the House and Senate, and signed into law in 2009 by Democrat Governor Brian Schweitzer. The law has caused socialists in Montana to be challenged and is presently on its way for a Supreme Court decision. Mr. Boniek is a strict constitutionalist and represented his constituents while in office well. He never wavered in principles and his duty to uphold the Montana State Constitution or the Constitution of the United States. He is a card-carrying charter member in the Constitutional organization known as Oath Keepers, Inc. He was in court on November 20th, 2012 after having been arrested and charged with obstructing a peace officer, resisting arrest and fleeing from or eluding a peace officerin July of 2012. Each charge is a misdemeanor. Explanation about events leading to his arrest is in the article. It began with a wild fire in Paradise Valley, one of a number of wild fires because of the dreaded drought that has plagued the United States. It is a case of police brutality and police not using common sense. With the help of the media bias and misinformation, a citizen trying to protect his property and save the lives of his livestock ended up to look like some criminal. It is a modern 21st Century rendition of civil disobedience, like the essay written by Henry David Thoreau of the same title. The police officers arrested Joel instead of helping him continue with saving his family, ranch and livestock, but saved by local volunteer fire fighters from burning up – fellow organized citizens more efficient than government taxpayer paid employees. The articles and headlines are linked in the article. A must read to see how corrupt our judicial system is and how far away from the Constitution’s articles of law and its amendments of rights and liberties the government has ignored and transgressed against their oath of office. It was gleeful for me to see that the Leftist, popular with progressive-socialists who falsely call themselves “liberal”, website, Huffington Post ran misleading headlines: Leads Heckling of Judge – and other points made in their article. Oddly, the founder of Huffington Post is an immigrant from a socialist, welfare-state nation who is paying the price as it collapses economically – one would think she would not be sucked up into the American socialist movement pretending to be true Democrats and liberals. They are strongly supported by the mainstream media, who has taken sides with communists and socialists since the Cold War and Vietnam — as those of us who refuse to be brainwashed and seek truth or have awaken, like myself and others like Ronald Reagan, and major columnists are aware. Anyway, read the ARTICLE. It is stimulating in the fact that maybe Americans are finally standing up and telling the unconstitutional fellow Americans – NO! Joel Boniek is a constitutionalist hero. This entry was posted in Big Government, Constitutional Crisis, Judiciary, Rule of Law.